Ironing is a task few relish, but sometimes hanging your clothes in the bathroom during a hot steamy shower just isn't enough to get the job done. When you do reach for the iron, you may find that it's not working quite right, especially if it's been sitting unused for a while. Fortunately, irons are fairly simple devices and troubleshooting a broken one isn't complicate. A good cleaning fixes most iron issues and the rest typically involve avoiding tap water in your iron and making sure it's not too full. If a few basic tweaks don't fix the problem, you're probably due for a new iron. If you smell something hot or burning, stop using your iron immediately and check it out. Begin by checking the item you're currently ironing. Make sure there are no burn marks on it and that any decals or embellishments aren't overheating or melting. If they are, turn down the heat on your iron. If your current garment looks fine, turn the iron off and allow it to cool completely. When it has, clean the sole plate on the bottom of the iron with a rag dipped in vinegar. This will remove any fibers or particles that are sticking to the iron and heating up along with the appliance. 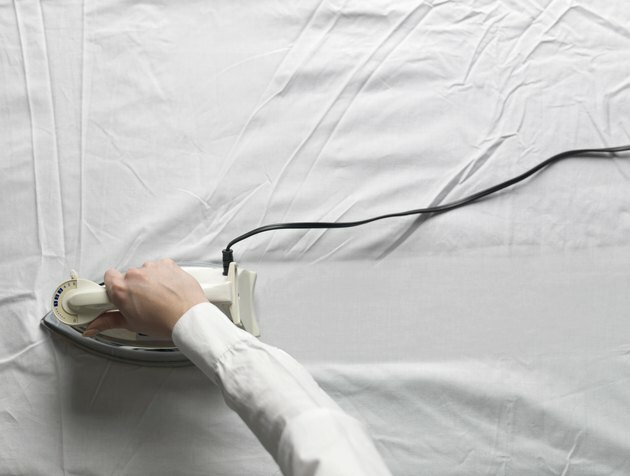 If you're ironing a fabric you know is sensitive to heat, place a clean towel between the garment and the iron for protection. You may notice that water droplets appear on your clothes while you iron. If so, check your steam setting and make sure it's turned up as high as it will go. When the steam setting on the iron is too low, the appliance can't convert the water to steam fast enough and it may drip out of the iron as you use it. If your steam setting is already maxed out, pour some of the water back out of your iron. You should always leave a little room in your iron rather than filling it to the brim with water. An overly full iron is also a leaky one. If your iron is full and plenty hot but still not steaming, you're probably dealing with clogged steam vents. Unplug your iron and let it cool completely. When it has, use a cotton swab dipped in distilled water to clean the steam vents on the sole plate. Empty the water reservoir and refill it with three-fourths cups of distilled water and one-fourth cup of vinegar. Iron a towel or rag on the maximum steam setting until the iron is empty to flush the steam vents completely. After cleaning, always store your iron empty and use filtered or distilled water to prevent mineral buildup in the future. While it's good to stay cool under pressure, it's not a trait you want in your iron. If your iron isn't heating up, start by checking the obvious and making sure it's plugged in. We all have moments of distraction where we overlook the basics. If you're plugged in, make sure the iron is turned on and the temperature settings are in the right place. Still no heat? Try plugging the iron into another outlet to make sure the iron is truly the problem. If it is, it's probably time for a new iron. You can try having your iron professionally repaired if you truly love it, but it's typically less expensive to simply replace it.